Top 20 lines, likely to be overheard if you had a Klingon programmer on your software development team. 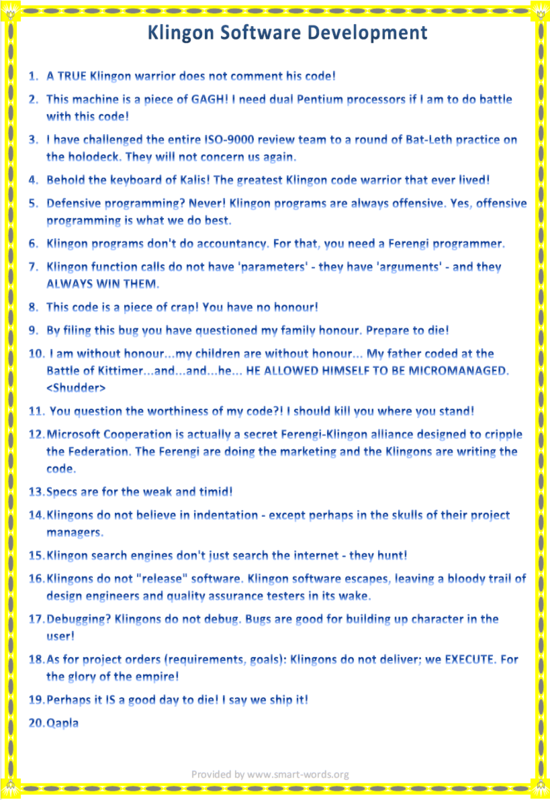 All Klingons who develop software for the glory of the empire follow this "Code of Honour" and are so called "code warriors". It is the only form of Quality Assurance which is accepted by this race. ← all 20 lines as an image for download as a high resolution image. I have challenged the entire ISO-9000 review team to a round of Bat-Leth practice on the holodeck. They will not concern us again. Behold the keyboard of Kalis! The greatest Klingon code warrior that ever lived! Defensive programming? Never! Klingon programs are always offensive. Yes, offensive programming is what we do best. Klingon programs don't do accountancy. For that, you need a Ferengi programmer. This code is a piece of crap! You have no honour! By filing this bug you have questioned my family honour. Prepare to die! You question the worthiness of my code?! I should kill you where you stand! Microsoft Cooperation is actually a secret Ferengi-Klingon alliance designed to cripple the Federation. The Ferengi are doing the marketing and the Klingons are writing the code. Specs are for the weak and timid! Klingons do not believe in indentation - except perhaps in the skulls of their project managers. Klingon search engines don't just search the internet - they hunt! Klingons do not "release" software. Klingon software escapes, leaving a bloody trail of design engineers and quality assurance testers in its wake. Debugging? Klingons do not debug. Bugs are good for building up character in the user! As for project orders (requirements, goals): Klingons do not deliver; we EXECUTE. For the glory of the empire! Perhaps it IS a good day to die! I say we ship it! Remark: The Klingons are a warrior race in the fictional Star Trek universe. Their culture is centered on honor and combat (with some resemblance to the culture of the Samurai).